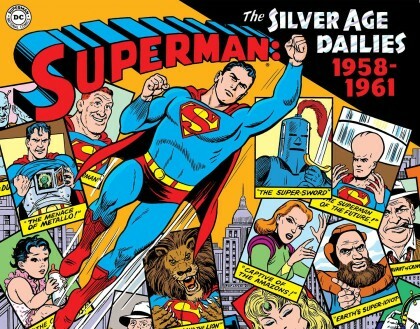 ANDY’S PICK :: SUPERMAN SILVER AGE NEWSPAPER DAILIES HC 1958-1961: The Superman newspaper strip was very popular and rather long lived beginning in 1939 and ending in 1966. Our good friends at IDW/Library of American Comics plan to reprint the entire 27 year run. And instead of starting back at the beginning (those first years have already been reprinted a number of times) this inaugural volume reprints (for the first time!!) all the daily strips from December 1958 to July of 1961 . The stories were written by Superman co-creator Jerry Siegel along with Otto Bender and others and features art by Curt Swan, Wayne Boring and Stan Kaye. One of the highlights is a retelling of Siegel’s unforgettable “Superman Returns to Krypton” storyline. For anyone who wants to try a sampling of the strips before deciding to to buy the book, look here! Andy, shhhh. You had me at Curt Swan and Wayne Boring.